Our seasonal site rates for 2019 range from $2850 to $3100 plus hst and hydro. Winter storage is no charge if you are returning for the following season. Our seasonal sites are a good size and some will accommodate up to a 40 ft unit. We have 30 amp sites in the area near the pool and new 50 amp sites on the left just past the gate. The sites in the older area, near the pool, are treed and nicely shaded. The new 50 amp sites have some that back onto bush and some that are open. We will be planting trees this spring. We encourage everyone to landscape, build decks and sheds. All of our sites have hydro, water and sewer hookup to our septic system. 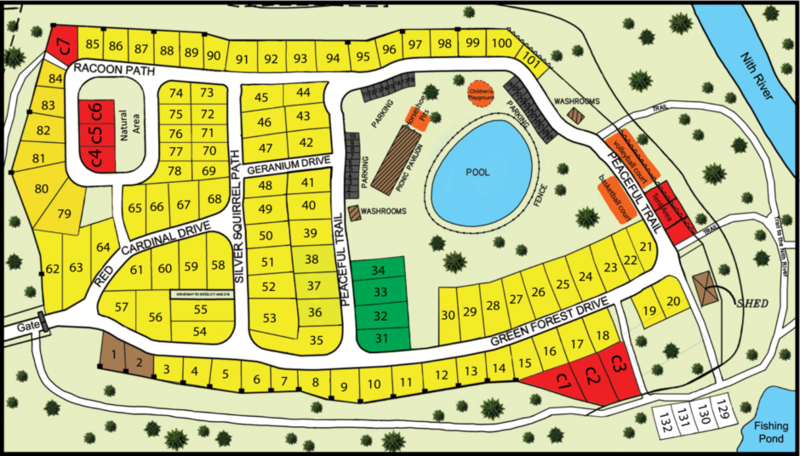 This Spring we will be selling park model units in the park on the new 50 amp sites. All units will be sold with a deck and railing. We have 4 different floor plans you can choose from, some of which have lofts. For site availability please contact us for up to date infromation.